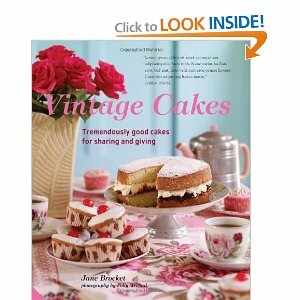 Here is something delicious: Jane Brocket's adorable Vintage Cakes. I'm just getting started and there's so much deliciousness ahead: cherry cakes, orange cream cakes, sponges . . . . It's beautifully styled with vintage linens, but not quite meticulously edited, sorry to say (this surprises me, as Jane Brocket strikes me as a very careful writer). However, it's nothing I can't overlook in my enjoyment of this charming cookbook. Ill have to check that out! That definetly looks like my kind of book! I love the linens,and tea settings! Please let us know how some turn out! I own it, but haven't used it yet - I've been in pie and cookie mode. btw - have you seen "Little Stitches" by Aneela Hoey? Check it out! Charming, charming, charming embroidery. I love her books and I just bought her Turkish Delights & Treasure Hunts for my daughter, who enjoys English children's literature with her kids. I do remember the same issues in The Gentle Art of Domesticity. They were not converted from the metric correctly in the first edition and my copy came with a print out of corrections. This looks scrumptious! Will this be a tour as in The Cake Lady? I will see if my library carries it. Farrah, I was trying to resist the urge to bake my way through it, but cakes one and two were really good . . .